Fish Lake lies between Brown Mountain and Mt. McLoughlin, surrounded by majestic old growth forests. Originally a small natural lake, it has been enlarged by several construction projects intended to help irrigate the Rogue Valley. Beginning in 1898, the Fish Lake Water Company has enlarged the lake by a factor of three, to its present area of 430 acres. Fish Lake Dam was constructed between 1902 and 1908, modified again in 1922 and again in 1996 to its current area of 483 acres. 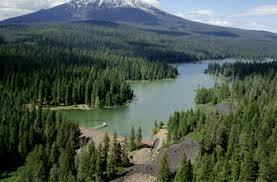 It brings water from the Klamath River watershed by way of the Cascade Canal from Fourmile Lake. O. C. Brown, for which the nearest peak, Brown Mountain is named, in 1899 declared this area as “grand forest of fir embracing three beautiful lakes” surrounded by “massive peaks of frowning rocks.” Visitors can still enjoy the majesty of the fairly recent volcanic landscape. Since Fish Lake was recently formed, geologically speaking, the water is clear and cold, and provides great trout fishing early in the season. Fish Lake Resort offers four kinds of boats for rent, from canoes to motorboats, by the hour or by the day. The lake has a 10 mph speed limit, so leave those jet skis at home. Their café has excellent comfort food for breakfast, lunch or dinner every day during the summer season, with Friday and Saturday steak or salmon, plus a chef’s special. Lodging runs from no hook-up tent sites, RV sites with just electrical or full hook-up, yurts and fully furnished cabins. Another interesting amenity is the opportunity to visit with the ambitious hikers trekking the distance from Mexico to Canada along the Pacific Crest Trail. The resort offers these back country adventurers a place to shower, re-supply, and pick up mail, which they can have held for them by the resort. In the winter months, the facilities are closed, but many visitors come to enjoy cross country skiing, snowmobiling, show shoeing, and tubing on the varied terrain around the lake. A caution: winter snow can insulate the lake water from freezing firmly enough to bear weight. Don’t risk an unexpected swim! The camping available at Fish Lake is for both RV and tent campers. For those looking for more solitude, load your backpack and head east into the breathtakingly lovely Sky Lakes Wilderness region. One of the many trail heads into this alpine wilderness area begins on Forest Road 3640, half a mile past milepost 35 on Highway 140. Bring maps of the area. 30 miles from Ashland, 39 miles from Medford, at 4,642 feet of elevation, Fish Lake is accessible most of the year, with occasional snow closures. Check road conditions in the winter on tripcheck.com – they have a camera on Highway 140 at milepost 37. From Ashland, Oregon travel east on the Dead Indian Memorial Road 22 miles to Forest Service road 37 (Big Elk Road). Turn left and continue 8 miles across Big Elk Road to Highway 140. Turn east (right) onto Highway 140 and continue 3 miles to the Fish Lake access road on the right. Travel 0.5 miles to the campground entrance to the west (right). From Medford, Oregon take Highway 62 towards White City about 8 miles and turn right on to Highway 140. Travel east towards Klamath Falls on Highway 140 for 30.4 miles, turn right on Fish Lake access road. The campground is ½ mile on the right. This alpine region is characterized by large conifer trees Nobel Fir, Oregon White Pine, and Mountain Hemlock, with groves of aspen instead of alder in the wet areas, and a more open understory. The animal that visitors will encounter most often is the chipmunk, which is not at all shy in the campgrounds. See if you can distinguish between the four varieties of chipmunks that inhabit these forests. Counting stripes, facial markings, and of course, size are identifying factors. Local Tip: Springtime is a big draw for fishing. Visits to the lake later in the season will appeal to those wanting to avoid sharing the shoreline with avid anglers.